The importance of oil change service is often overlooked. Fresh oil is necessary to keep your engine running smoothly. Getting an oil change with the right oil can extend the life of your engine and even improve performance. However, if you don't get an oil change when your vehicle needs one, you might have to deal with reduced performance and it may even shorten the life of your engine. It's very important that you get oil changes at the intervals recommended by our technicians. If you aren't sure whether or not your car needs an oil change, bring it in and we'll let you know. If you want to reduce the chance of expensive auto repair bills, come into Bob Moore Subaru today for oil change service. How often you should get an oil change changes based on which kind of oil is used. Conventional oil is the most affordable at the time of the oil change. However, it does not last as long as semi-synthetic or fully synthetic oil. The general rule is that a conventional oil change will last for 3,000 miles. You don't have to go to a lube shop for oil change service. Come into a reputable Oklahoma City car dealership. Visit the experts at Bob Moore Subaru today. Semi-synthetic oil, also known as synthetic blend, has become popular for many cars. It gives many of the benefits of fully synthetic oil at a lower price point. Plus, it can last longer than conventional oil. Many experts state that semi-synthetic oil can last for up to 5,000 miles, which is about as long as fully synthetic oil. One highly effective type of semi-synthetic oil is high-mileage oil. This type of oil can also be fully synthetic. High-mileage oil is usually recommended for cars that have more than 75,000 miles on the odometer. It contains special ingredients that swell the seals in your car's engine. This helps reduce or even prevent oil leaks, which are common in cars with high-mileage. Bring your car into our dealership in Oklahoma City. Get an oil change service with the right type of oil for your car. The most advanced type of oil is fully synthetic oil. Fully synthetic oil has been around for many years. However, there have been several recent advances in synthetic oil technology that have increased its effectiveness and longevity. Drivers can go up to 5,000 miles between oil changes if fully synthetic oil is used. High-mileage oil can also be fully synthetic. Fully synthetic high-mileage oil may even be more effective in preventing or reducing oil leaks than semi-synthetic oil. When you bring your car into Bob Moore Subaru for an oil change service, ask your tech about semi-synthetic and fully synthetic oil. If you're in Edmond, Yukon or elsewhere in the Oklahoma City-area and you want to get a quick oil change, come into Bob Moore Subaru today. 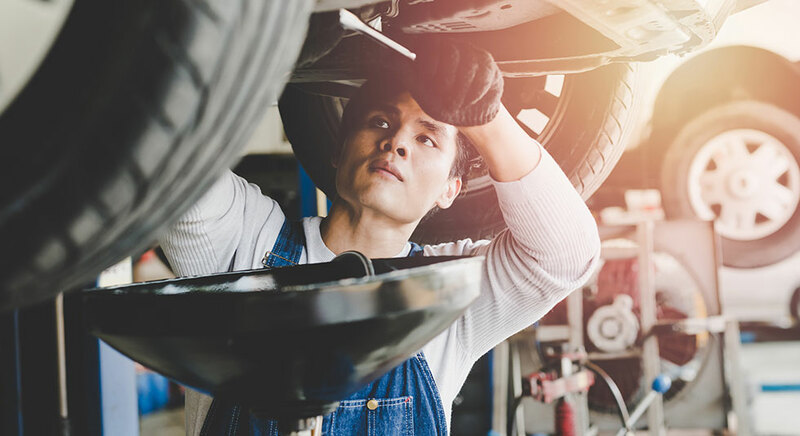 If it's time for an oil change service or another type of routine maintenance, bring your car into Bob Moore Subaru dealership in Oklahoma City today. We love to work on all Subaru vehicles, but we're happy to work on vehicles from other manufacturers, as well. If you want to get premium service from an authorized Subaru dealer, Oklahoma City area dealership Bob Moore Subaru has got you covered.